Playing hall, Thanksgiving Scholastic Tournament. Photo courtesy of Washington Chess Federation. 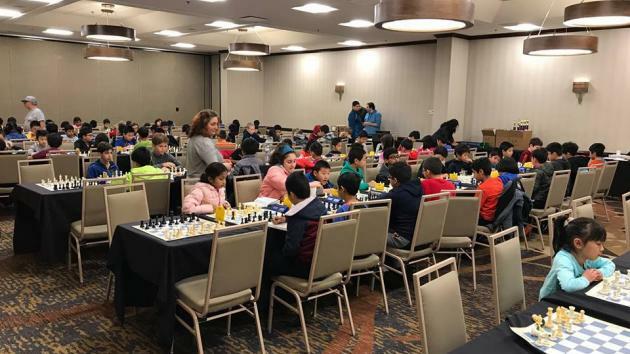 The Washington Class Championship is traditionally a big tournament, the second-biggest of the year, and is held in Lynnwood, a suburb about 20 miles north of Seattle. Normally I've commuted, but this year my husband suggested I get a hotel room in Lynnwood to conserve energy. I knew energy would be an issue--my work situation had been difficult all fall and was steadily getting worse--so I took him up on this. I also chose to play in Class A. Last year I tried Expert, which was definitely educational but rather harsh; I didn't feel up to it this year. On the first day we shared the venue with a huge scholastic tournament (shown in the image above). If even a fraction of those little guys (and girls--there were a lot of girls!) stay with the hobby, our future looks bright--as long as you can stomach losing games to players who have to stand on their chair to reach the back of the board. My opponent in the main tournament was a bit bigger than that (I believe she's 13). I like to refer to her as "the dangerous Sophie Tien" and she lived up it in this game. That was not how I wanted to start the tournament, though it was an interesting game and a good fight. I'd thought that late-round fatigue would be my biggest enemy, but here it was round 1 and my judgement was already, apparently, not too good. And of course there was another round to play that evening.... I comforted myself with the idea that this was a Swiss Gambit--a manuver in which you draw or lose the first round of a Swiss-system tournament in order to have easier pairings for the rest of the event and maybe grab a prize. Except there aren't really any easy pairings in a class tournament. Oops. In round 2 I did have a relatively easy pairing, a young 1700 player playing up a section. He tried my favorite opening against me and gave me a wonderful attacking position which I somehow had difficulty converting. Afterwards my opponent had some grumpy things to say about how long it took me to beat him. I don't think he enjoyed the process. I was pretty pleased with my two-rook sacrifice, even though Anthony was right that I'd missed simpler wins earlier. Partway through one of these rounds we heard a vast, strange hissing sound from outside the tournament hall. Half the players rushed out, and found that it was hailing furiously on the glass ceiling of the main hotel atrium. The acoustics must have been strange, because I've never heard anything quite like it. I had arranged to share a room with another player, but there was no sign of her anywhere. I waited for a couple of hours before checking with the TD and discovering that she'd withdrawn and, presumably, gone home. This cost me some sleep, but not as much as taking the bus back to Seattle would have. This game is not particularly deep. My opponent was ill-prepared for my strange opening and gave me a dream position out of it. But it was wicked fun to play. My record with the Fantasy Variation is amazingly good, given that my entire knowledge of it consists of having read the short account in Gambiteer and watched half a video series--the computer containing it died, so I never saw the second half. It does seem to suit me. An aggressive Black player could probably give me a lot of trouble, but naturally aggressive players seldom favor the Caro-Kann. It takes only a few timid moves to get a really bad game. I went back to the hotel and tried to get some sleep. As it turns out, my next opponent was involved in the very last game to finish that night. He hung around to see the pairings, found we would be playing, and decided to seize the opportunity to prepare for me. Our previous game was a hyper-violent Dutch that finally turned in my favor; understandably, he didn't want to repeat that. A very nice display of smooth, confident chess from my opponent. I invited him out to lunch, partly to analyze the game (there was, helpfully, a chessboard printed on the burger joint's table!) and partly to ask a question that half the Northwest has been wondering, namely how had Nicholas managed to come back from a couple years' hiatus so much stronger than before? He said it was quite simple: the summer between high school and college he didn't know what to do with himself, so he played and studied chess online 6-8 hours a day! I found myself somewhat jealous. I love scientific research but in recent years have become increasingly tired of the required grant-writing, especially as all three of my recent grants were rejected. Unfortunately my academic position doesn't come with sabbaticals. A summer playing chess sounds awfully good. When the dust settled, Joshua Lewis-Sandy (who I have mysteriously never played, though we have been in many of the same events) had won first, Nicholas was second and Alec was third. I certainly had a good set of opponents, and there was some good chess played (much of it by my opponents, but it's an accomplishment at this level even to give a good fight). The hotel-room experiment is probably a win, though it's expensive; I suspect that I'd have done even worse if I'd had to commute by bus. As it was, I was evidently tired. I've written that after every tournament for a while, and (spoiler) the next two will repeat the chorus. My coach and I have been exploring various strategies to play better when fatigued and/or be less fatigued, but it's a hard long-term problem. I am an adult player trying to make a comeback after 27 years away from competition. This blog mainly covers my tournaments, with occasional forays into other topics.